Staff of ILRI’s Tick Unit dissect ticks to extract the parasite Theileria parva, which causes East Coast fever in cattle (photo credit: Brad Collis). 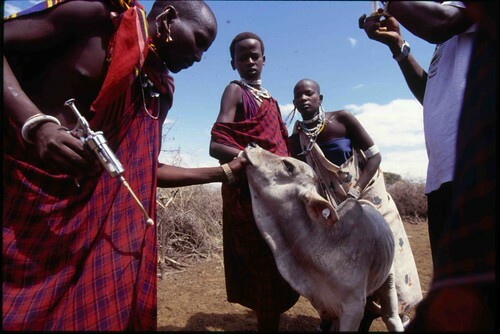 A vaccine that protects cattle against East Coast fever, a deadly disease in eastern and central Africa, is being developed by scientists in Kenya working for the International Livestock Research Institute (ILRI) jointly with scientists at the Agricultural Research Service (ARS) Animal Disease Research Unit in Pullman, Washington, which is part of the United States Department of Agriculture (USDA). ARS is the USDA’s chief intramural scientific research agency. This research, which looks at combination vaccines for tick-borne diseases, supports USDA’s priority of promoting international food security. Scientists are focusing on the tick that transmits the parasite responsible for East Coast fever. Because this host tick and its parasite are similar to the tick and parasite that cause babesiosis, commonly called Texas cattle fever, in the United States, developing a vaccine for East Coast fever could lead to a vaccine for Texas cattle fever, which is a serious illness for wild and domesticated animals, especially cattle. In an initial study, scientists developed a polymerase chain reaction test that detects parasite DNA in ticks. 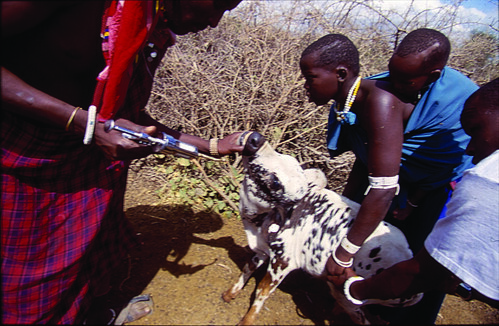 They used tick populations that were produced at ILRI to have different susceptibilities to infection with the parasite. Two different strains of ticks—Muguga and Kiambu—were compared. The Muguga ticks had a low level of parasitic infection, whereas the Kiambu ticks were highly susceptible. Understanding genetic differences between these two tick populations could lead to the identification of proteins that might be good targets for a vaccine to help control East Coast fever. This international partnership is part of a global community effort to control diseases that limit food and fiber production. Although East Coast fever isn’t currently a problem in the United States, this collaborative research aids in keeping the US and other countries free of the disease. Results of this collaborative research may be applied to help control similar parasitic diseases. Findings from this research were published in Gene and in the Journal of Medical Entomology. Read more at the United States Department of Agriculture Agricultural Research Service: Partnership focuses on developing East Coast fever vaccine, 4 Oct 2011. Read more about this project on ILRI’s website. 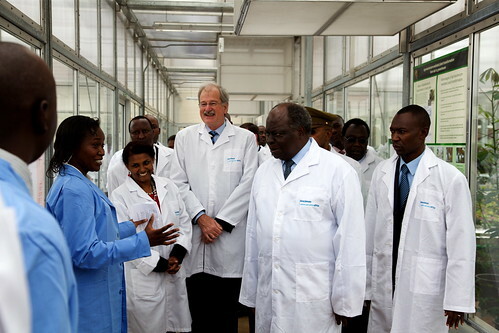 Biosciences eastern and central Africa (BecA) is a regional research platform located in Nairobi, Kenya, that was officially launched by Kenya’s President Mwai Kibaki and other dignitaries in November 2010. The BecA Hub gives scientists and students from across the region access to state-of-the-art facilities in the life sciences. One woman’s long-term commitment is responsible for much of this achievement. Gabrielle Persley is an eminent Australian plant scientist who directs a Doyle Foundation, named after her late husband, Jack Doyle, who for some two decades served as deputy director general-research of the International Laboratory for Research on Animal Diseases, a predecessor of the International Livestock Research Institute (ILRI), headquartered in Nairobi, Kenya. For the last several years, Persley has served as senior advisor to ILRI’s director general, Carlos Seré. In this 15-minute ILRI film, Persley describes an eventful, multi-year, and at times seemingly heroic, odyssey as she and others at ILRI, the Kenya Agricultural Research Institute, the New Partnership for Africa’s Development, and the Canadian International Development Agency, along with other organizations, nursed the BecA Hub project at ILRI from the drawing board through political deliberations and, finally, into a brand spanking new laboratory complex on ILRI’s campus serving as a regional biosciences resource. This was Persley’s last seminar at ILRI, before she left to return to her native Australia, where she is continuing her life-long work for international agricultural research for development with Australia’s Crawford Fund and other institutions and initiatives. For more about the BecA Hub, visit the BecA Hub website. Or watch this 7-minute ILRI film describing the work being done at the BecA Hub done by young scientists and students. Or watch this 3-minute ILRI photofilm that, through photographs and quotations, sums up the November 2010 opening of the research facility by Kenyan President Mwai Kibaki and other dignitaries. Carlos Seré, director general of ILRI; Bruce Scott, director of Partnerships and Communications at ILRI; and Romano Kiome, permanent secretary in Kenya’s Ministry of Agriculture; in discussion at the official opening of BecA at ILRI (photo credit: ILRI/MacMillan). Following are key highlights from speeches read on Friday 5 November 2010 during the official opening of the Biosciences eastern and central Africa (BecA) Hub, which is hosted and managed by the International Livestock Research Institute (ILRI), at its Nairobi headquarters and laboratories. His Excellency, David Collins, Canadian High Commissioner to Kenya said ‘Canada is pleased to celebrate the achievements that have been made in establishing this particular centre of excellence in bioscience in agriculture. He said Canada’s investment in BecA has supported the construction of new facilities and the renovation of existing facilities, including laboratories. With the completion of construction, the Hub is now in full operation, with a number of significant research programs under way, and quickly gaining regional and international recognition as a world-class facility to support capacity for biosciences in Africa. ‘The hub will enable African scientists and researchers play a major role in helping Africa meet its Millennium Development Goals by 2015 as a more productive and profitable agricultural sector is a critical component in the successful attainment of the MDGs,’ he added. ‘It is exciting to see the birth of a hub that will play a key role in ensuring that Africa drives its own agenda in regards to agriculture and strengthens the research pillar of the Comprehensive Africa Agriculture Development Program.’ Collins said. Carlos Seré, director general of ILRI, made the following remarks (full text). ‘It is indeed a very special honour to welcome you to the ILRI campus on the occasion of the opening of the Biosciences eastern and central Africa Hub. ‘Today we are witnessing the realization of that shared dream. Your Excellency, the strong support of the Kenyan Government to ILRI over the years has been critical to making this happen. Dr Romano Kiome, your Permanent Secretary of Agriculture and ILRI board member, passionately supported this initiaitive in its early days and chaired its first steering committee. Similarly, the financial and technical support of the Government of Canada and many other development partners was absolutely critical. NEPAD’s vision and leadership in driving a continent-wide strategy for science and technology as a key building block for Africa’s development provided a strong case for creating BecA. His Excellency Mwai Kibaki, president of Kenya, listens to Lydia Wamalwa, a plant molecular biologist, during the official opening of the Biosciences eastern and central Africa Hub on 5 November 2010; in the middle, Carlos Seré, director general of the International Livestock Research Institute (ILRI), which hosts and manages the BecA Hub, looks on (photo credit ILRI/Masi). A world-class research facility, the Biosciences eastern and central Africa Hub, was officially opened in Nairobi, today, by Kenya’s President Mwai Kibaki. This opening follows a scientific conference, Mobilizing Biosciences for Africa’s Development, which was held the day before at the International Livestock Research Institute (ILRI), which hosts and manages the new facility. The BecA Hub is open for use by researchers from Africa and around the world who are working to improve African agriculture. 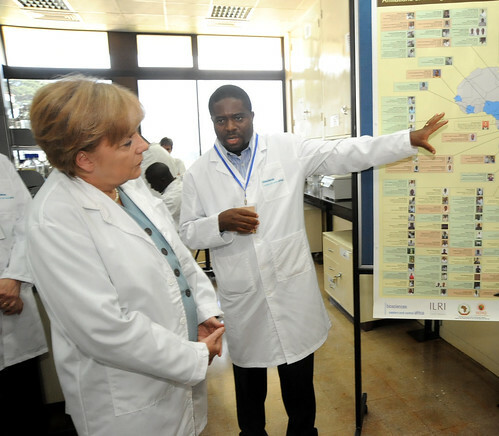 The BecA Hub puts Africa’s research capacity on par with some of the world’s most advanced research institutes. ‘With the help of our many partners and investors, the research undertaken here will have a lasting impact in developing agriculture in Africa,’ says Carlos Seré, director general of ILRI. The BecA Hub at ILRI brings the latest cutting-edge technologies into the hands of African graduate students and scientists. The Hub serves as a science integrator, allowing researchers to work together across institutional, national and disciplinary boundaries. There are already some 150 scientists, technicians and students using the facility today. The BecA Hub intends to double this number in the next five years. Since 2007, almost 1500 scientists have participated in BecA Hub conferences, workshops and short-term training and 100 graduate students and 57 visiting scientists have undertaken research at the facility. While the BecA Hub was formed to directly serve 17 countries in eastern and central Africa, demand for its use has been so strong that it now serves Ghana, Mali, Nigeria, Senegal, South Africa and Zambia, as well as other countries beyond the continent. Research at the BecA Hub focuses on some of Africa’s biggest agricultural problems, including frequent droughts, devastating crop pests, diseases and weeds, lethal livestock diseases and unsafe foods. ‘We aim to help build Africa’s capacity by empowering its scientists to lead the coming African agricultural revolution from within,’ says the facility’s director, Segenet Kelemu, a leading Ethiopian bioscientist. African and international scientists are working here to develop drought-tolerant food crops. They are also working to improve food safety in Kenya by reducing the amount of its maize crop that is contaminated by aflatoxins, which cause cancer, stunt children’s growth, increase vulnerability to disease and, at high levels, kills. In addition, these scientists have developed and validated a new test for detecting bush meat being sold in Kenya’s butcheries, a diagnostic that can safeguard both wildlife populations and human health. The BecA Hub began in 2004 as part of the African Union/New Partnership for Africa’s Development (NEPAD)’s African Biosciences Initiative, which was part of a framework of Centres of Excellence for Science and Technology and the Comprehensive African Agricultural Development Programme. The Hub was also aligned with regional priorities set by the Association for Strengthening Agricultural Research in Eastern and Central Africa. The Canadian International Development Agency strongly supported the Hub by funding renovation of laboratories already existing at ILRI’s Nairobi campus and the construction of new facilities. 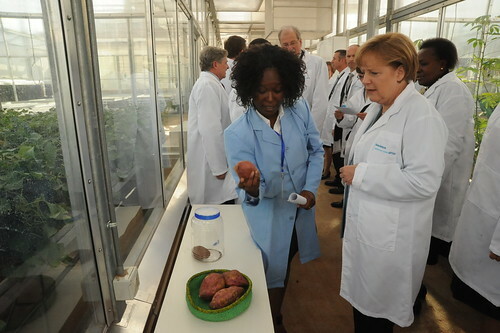 The 10,000-square-metre laboratories already host many researchers from Africa’s national agricultural research systems and several centres of the Consultative Group on International Agricultural Research. The facilities are now complete and the BecA Hub is ready to operate at full capacity. The Syngenta Foundation for Sustainable Agriculture, a long-time supporter, is helping to fund the Hub’s operations through 2014. And many other investors are supporting specific research and training projects. ‘The BecA Hub at ILRI serves as a focal point connecting African science to fast-moving scientific superhighways in the rest of the world,’ says Knut Hove, chair of the ILRI Board of Trustees. For example, BecA Hub graduate students have formed a group dedicated to bioinformatics. They are using the Hub’s high-performance computing platform, fast internet connectivity and bioinformatics expertise for ongoing peer-to-peer training. The group has organized international workshops and published a paper in a leading international journal. Some of these students have been awarded scholarships from the Australian Agency for International Development; Nescent, Durham, USA; and EMBL‐European Bioinformatics Institute, Cambridge, UK. Romano Kiome, permanent secretary in Kenya’s Ministry of Agriculture, says that Kenya is proud to host a facility that is allowing leading African scientists to return home to work on African problems. The pulverizer feed mill that is taking off on small dairy farms in East Africa (photo credit: East African Dairy Development Project). Pulverizer machines can help small-scale farmers in East Africa transport, store and stall-feed their ruminant animals with the bulky dry forages they may have at hand on and near their farms. Such dry forages include grass and legume hays; fibrous crop residues such as stovers of maize, sorghum, and millet; cereal straws of rice, teff, wheat, barley and oats; and haulms of beans. Pulverizers shred this forage into lengths of a few millimetres. 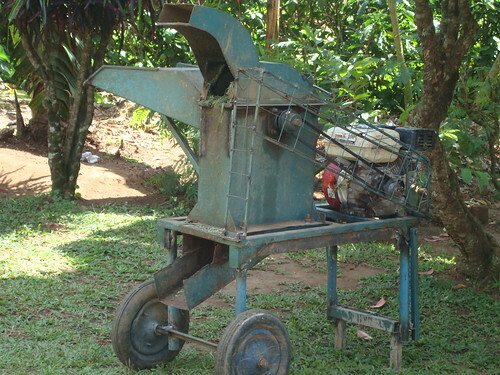 Although pulverizers have been around for a long time, they have been little used on small farms. But now this technology is being promoted by an East African Dairy Development Project to improve the use of the crop residues and roughages available to smallholder farmers in Kenya, Uganda and Rwanda. Project staff are helping service providers to purchase pulverizers through loan schemes, are setting up business development services as part of local dairy ‘hubs’, and are providing technical back-up support. The rapidly increasing numbers of providers of this technology are generating competition and sparking innovations, such as mobile service providers. Physically treating roughages is a main way to enhance the availability of their nutrients for cows and other ruminants. Pulverizing roughages on farms reduces their wastage by 30–60 per cent, while easing the fodder packaging, storing, transporting and feeding by farmers enhances the feed intake of farm animals by 30–60 per cent.. When did these services start? Pulverizer services started in 2009 with about 20 operators in Kabiyet and Kipkaren districts in Kenya’s North Rift Valley; these have mushroomed in the last year to more than 200 operators in Siongiroi and Kipkelion in South Rift Valley as well Kieni and Ol-Kalou districts. The technology has also been replicated through dairy farmers business associations in Kiboga and Masaka districts of Uganda and Rwamagana, Gatsibo and Nyagatare districts of Rwanda. Local producers have now ventured into fabricating the machines, making them easily and cheaply available to the farmers. Use of the pulverizer technology can increase profitable beef and milk production through more efficient use of forages, a benefit particularly valued by farmers during dry seasons, when forages are scarce. Among the most common users of the technology are service providers who transport and trade dry forages and others that pulverize forages on farms. 1. The hubs being created in this East African Dairy Project are providing the stimulus for new livestock feed markets as well as farmer access to credit (the credit is provided against their milk sales), which farmers often invest in improved feed production. 2. The clustering of dairy input services in local dairy hubs is enhancing community access to feed information, business skills and other resources useful to agribusiness entrepreneurs. 3. Smallholders are very interested in making better use of their crop residues for dry-season stall feeding. 4. When demonstrating use of the pulverizers to farmers, with the aim of increasing their adoption of this technology, service providers should stress ways the technology could directly benefit the farmers rather than how the technology works. 5. Dairy farmer business and related associations should be supported and used to scale up use of this technology by farmers and farmer groups. 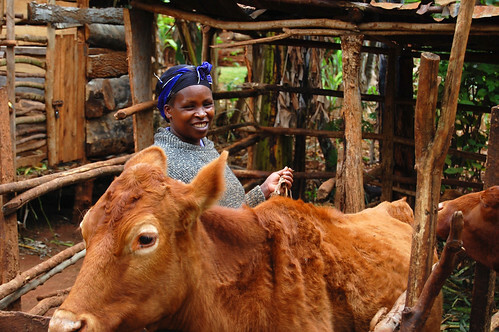 The East African Dairy Development Project envisions transforming the lives of 179,000 families by doubling household dairy income in 10 years through integrated interventions in dairy production, market access and knowledge application. The Project is working to improve on-farm productivity by increasing milk production, improving milk quality and providing access to production inputs through business delivery services. The Project aims to improve market access by developing local hubs of business delivery services in association with chilling plants that facilitate market access. The Project is also linking producers to formal markets through processors and increasing the benefits milk producers obtain from traditional markets. The Project is funded by the Bill and Melinda Gates Foundation. The article was developed by Beatrice Ouma, regional senior information officer in the East African Dairy Development Project, and Ben Lukuyu, a scientist working at the International Livestock Research Institute, one of the partners collaborating in this Project. For more information, contact the Project at eadd@eadairy.org or read about recent progress of the Project on the Bill and Melinda Gates Foundation website. D’ « anciennes » espèces bovines d’Afrique de l’Ouest, résistantes aux maladies, figurent parmi les races qui risquent de disparaître parce que le bétail importé est en train de supplanter un précieux cheptel indigène. Une action urgente est indispensable pour arrêter la perte rapide et alarmante de la diversité génétique du bétail africain qui apporte nourriture et revenus à 70 % des Africains ruraux et constitue un véritable trésor d’animaux résistants à la sécheresse et aux maladies. C’est ce que dit une analyse présentée aujourd’hui à une importante réunion de scientifiques africains et d’experts du développement. Les experts de l’Institut international de recherche sur l’élevage (ILRI) ont expliqué aux chercheurs réunis pour la cinquième Semaine africaine des sciences agricoles (www.faraweek.org), accueillie par le Forum pour la recherche agricole en Afrique (FARA), que des investissements sont indispensables aujourd’hui même pour intensifier, en particulier en Afrique de l’Ouest, les efforts d’identification et de préservation des caractères uniques de la riche variété de bétail bovin, ovin, caprin, et porcin, qui s’est développée au long de plusieurs millénaires sur le continent et qui est aujourd’hui menacée. Ces experts expliquent que la perte de la diversité du bétail en Afrique fait partie de « l’effondrement » mondiale du cheptel. Selon l’Organisation des Nations Unies pour l’alimentation et l’agriculture, près de 20 % des 7 616 races de bétail existant dans le monde sont aujourd’hui considérées comme à risque. M. Fall décrit les différentes menaces qui pèsent sur la viabilité à long terme de la production de bétail en Afrique. Ces menaces comprennent une dégradation du paysage et le croissement avec des races « exotiques » importées d’Europe, d’Asie et d’Amérique. Par exemple, on assiste à un croisement sur une très large échelle de races des zones sahéliennes d’Afrique de l’Ouest et susceptibles aux maladies avec des races adaptées aux régions subhumides, comme le sud du Mali, et qui ont une résistance naturelle à la trypanosomiase. La trypanosomiase tue entre trois et sept millions de tètes de bétail chaque année et son coût pour les exploitants agricoles se chiffre en milliards de dollars, lorsqu’on prend en compte, par exemple, les pertes de production de lait et de viande, et les coûts de médicaments et prophylactiques nécessaires au traitement ou à la prévention des maladies. Bien que le croisement puisse offrir des avantages à court terme, comme une amélioration de la production de viande et de lait ou une plus grande puissance de trait, il peut également faire disparaître des caractères très précieux qui sont le résultat de milliers d’années de sélection naturelle. Les experts de l’ILRI déploient à l’heure actuelle des efforts importants en faveur d’une campagne visant à maîtriser le développement d’une résistance aux médicaments chez les parasites qui provoquent la trypanosomiase. Mais ils reconnaissent aussi que des races dotées d’une résistance naturelle à cette maladie offre une meilleure solution à long terme. Ces races comprennent les bovins sans bosse et à courtes cornes de l’Afrique de l’Ouest et du Centre, qui ont vécu dans cette région avec ces parasites pendant des millions d’années et ont ainsi acquis une résistance naturelle à de nombreuses maladies, y compris la trypanosomiase, propagée par la mouche tsétsé, et les maladies transmises par les tiques. De plus, ces animaux robustes sont capables de résister à des climats rudes. Mais les races à courtes cornes et à longues cornes ont un désavantage : elles ne sont pas aussi productives que les races européennes. Malgré ce désavantage, la disparition de ces races aurait des conséquences graves pour la productivité future du bétail africain. Le Kuri aux grandes cornes bulbeuses du Sud Tchad et du Nord-est du Nigéria fait partie des bovins africains à risques. Non seulement il ne se laisse pas déranger par les piqûres d’insecte mais il est également un excellent nageur, vu qu’il s’est développé dans la région du lac Tchad, et est idéalement adapté aux conditions humides dans des climats très chauds. Les actions de l’ILRI en faveur de la préservation du bétail africain indigène s’inscrivent dans un effort plus large visant à améliorer la productivité de l’exploitation agricole africaine au travers de ce qu’on appelle la « génomique du paysage ». Cette dernière implique entre autre chose, le séquençage des génomes de différentes variétés de bétail provenant de plusieurs régions, et la recherche des signatures génétiques associées à leur adaptation à un environnement particulier. Les experts de l’ILRI considèrent la génomique du paysage comme étant particulièrement importante vu l’accélération du changement climatique qui impose à l’éleveur de répondre toujours plus rapidement et avec l’expertise voulue à l’évolution des conditions de terrain. Mais ils soulignent qu’en Afrique en particulier, la capacité des éleveurs à s’adapter aux nouveaux climats va dépendre directement de la richesse du continent en termes de diversité de son cheptel indigène. M. Seré souligne la nécessité de nouvelles politiques qui encouragent les éleveurs et les petits exploitants agricoles africains à conserver les races locales plutôt que de les remplacer des animaux importés. Ces politiques, dit-il, devraient comprendre des programmes d’élevage centrés sur la l’amélioration de la productivité du cheptel indigène comme alternative à l’importation d’animaux. Steve Kemp, qui dirige l’équipe de génétique et de génomique de l’ILRI, ajoute que les mesures de conservation en exploitation doivent également s’accompagner d’investissements en faveur de la préservation de la diversité qui permettront de geler le sperme et les embryons. On ne peut en effet exiger du seul exploitant agricole qu’il renonce à une augmentation de la productivité au nom de la conservation de la diversité. M. Kemp recommande une nouvelle approche pour mesurer les ressources génétiques du cheptel. Aujourd’hui, dit-il, l’estimation de ces caractéristiques porte essentiellement sur des éléments tels que la valeur de la viande, du lait, des œufs et de la laine, mais elle ne prend pas en compte d’autres attributs qui pourraient avoir une importance égale, voire supérieure, pour l’éleveur, qu’il soit en Afrique ou dans une autre région en développement. Ces attributs comprennent la capacité d’un animal à tirer la charrue, à fournir de l’engrais, à faire office de banque ou compte d’épargne ambulant, et d’être une forme efficace d’assurance contre les pertes de récolte. Mais l’association de ces multiples attributs avec l’ADN d’un animal exige de nouveaux moyens pour rechercher et comprendre les caractéristiques du cheptel dans une région caractérisée par une grande diversité et une grande variété d’environnements. « On dispose aujourd’hui des outils nécessaires, mais nous avons besoin de la volonté, de l’imagination et des ressources avant qu’il ne soit trop tard, » indique M. Kemp. Urgent action is needed to stop the rapid and alarming loss of genetic diversity of African livestock that provide food and income to 70 percent of rural Africans and include a treasure-trove of drought- and disease-resistant animals, according to a new analysis presented today at a major gathering of African scientists and development experts. Experts from the International Livestock Research Institute (ILRI) told researchers at the 5th African Agriculture Science Week (www.faraweek.org), hosted by the Forum for Agricultural Research in Africa (FARA), that investments are needed now to expand efforts to identify and preserve the unique traits, particularly in West Africa, of the continent's rich array of cattle, sheep, goats and pigs developed over several millennia but now under siege. 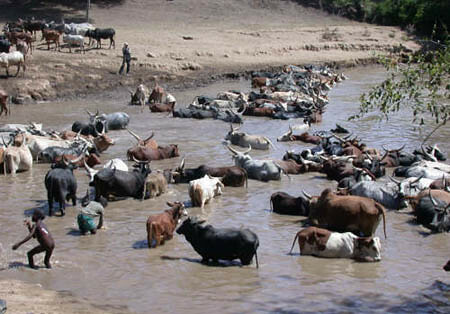 They said the loss of livestock diversity in Africa is part of a global 'livestock meltdown'. According to the United Nations Food and Agriculture Organization, some 20 percent of the world's 7616 livestock breeds are now viewed as at risk. Fall described a variety of pressures threatening the long-term viability of livestock production in Africa. These forces include landscape degradation and cross-breeding with 'exotic' breeds imported from Europe, Asia and the America. For example, disease-susceptible breeds from West Africa's Sahel zone are being cross-bred in large scale with breeds adapted to sub-humid regions, like southern Mali, that have a natural resistance to trypanosomosis. Trypanosomosis kills an estimated three to seven million cattle each year and costs farmers billions of dollars each year in, for example, lost milk and meat production and the costs of medicines and prophylactics needed to treat or prevent the disease. While cross-breeding may offer short-term benefits, such as improved meat and milk production and greater draft power, it could also cause the disappearance of valuable traits developed over thousands of years of natural selection. ILRI specialists are in the midst of a major campaign to control development of drug resistance in the parasites that cause this disease but also have recognized that breeds endowed with a natural ability to survive the illness could offer a better long-term solution. The breeds include humpless shorthorn and longhorn cattle of West and Central Africa that have evolved in this region along with its parasites for thousands of years and therefore have evolved ways to survive many diseases, including trypanosomosis, which is spread by tsetse flies, and also tick-borne diseases. Moreover, these hardy animals have the ability to withstand harsh climates. Despite their drawbacks—the shorthorn and longhorn breeds are not as productive as their European counterparts—their loss would be a major blow to the future of African livestock productivity. 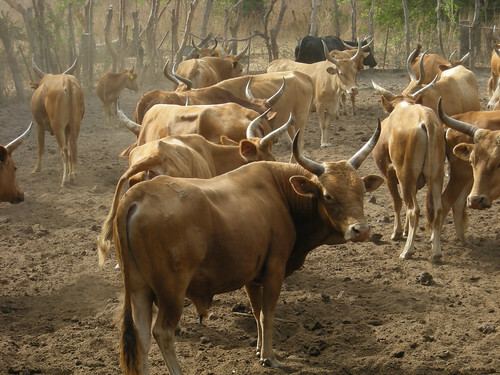 Other African cattle breeds at risk include the Kuri cattle of southern Chad and northeastern Nigeria. The large bulbous-horned Kuri, in addition to being unfazed by insect bites, are excellent swimmers, having evolved in the Lake Chad region, and are ideally suited to wet conditions in very hot climates. ILRI's push to preserve Africa's indigenous livestock is part of a broader effort to improve productivity on African farms through what is known as 'landscape genomics'. Landscape genomics involves, among other things, sequencing the genomes of different livestock varieties from many regions and looking for the genetic signatures associated with their suitability to a particular environment. ILRI experts see landscape genomics as particularly important as climate change accelerates, requiring animal breeders to respond every more quickly and expertly to shifting conditions on the ground. But they caution that in Africa in particular the ability of farmers and herders to adapt to new climates depends directly on the continent's wealth of native livestock diversity. Seré said new polices also are needed that encourage African pastoralist herders and smallholder farmers to continue maintaining their local breeds rather than abandoning them for imported animals. Such policies, he said, should include breeding programs that focus on improving the productivity of indigenous livestock as an alternative to importing animals. Steve Kemp, who heads ILRI's genetics and genomics team, added that in addition to conservation on the farm, there must also be investments in preserving diversity by freezing sperm and embryos because farmers cannot be asked to forgo productivity increases solely in the name of diversity conservation. Kemp called for a new approach to measuring the characteristics of livestock genetic resources. Today, he said, these estimates focus mainly on such things as the value of meat, milk, eggs and wool and do not include qualities that can be of equal or even greater importance to livestock keepers in Africa and other developing regions. These attributes include the ability of an animal to pull a plough, provide fertilizer, serve as a walking bank or savings account, and act as an effective form of insurance against crop loss. But associating this wider array of attributes with an animal's DNA requires new ways of exploring and understanding livestock characteristics in a region where there is so much diversity in so many different environments. 'The tools are available to do this now, but we need the will, the imagination and the resources before it is too late', Kemp said. The Association for Strengthening Agricultural Research in Eastern and Central Africa (ASARECA) is holding a conference—Climate Change Adaptation Strategies, Capacity Building and Agricultural Innovations to Improve Livelihoods in Eastern and Central Africa: Post-Copenhagen—in Addis Ababa, Ethiopia, 7–9 June 2010. Joining ASARECA for this 3-day sub-regional meeting are representatives from the Ethiopian Ministry of Agriculture and Rural Development; the Ethiopian Institute of Agricultural Research; the International Livestock Research Institute (ILRI), which has a principal campus in Addis Ababa; the International Center for Agricultural Research in the Dry Areas (ICARDA), based in Syria; and other regional and international partners. Participants of the ten countries that are members of ASARECA are being presented with the United Nations Framework Convention on Climate Change (UNFCCC) and implications for African countries of the resolutions of last December's climate conference in Copenhagen. The participants will assess the relative vulnerability to climate change of its ten member countries, as well as the impacts expected from climate change and the national agricultural adaptation strategies developed in those countries. The agricultural innovations and technologies already available for responding to climate change and variability will be assessed for their ability to improve livelihoods in the region's arid and semi-arid areas. The participants will recommend optimal ways to negotiate and facilitate implementation of international climate change agreements in the region as well as ways simultaneously to reduce the impacts of climate change and climate variability while improving livelihoods of dryland peoples, who are particularly vulnerable to a warming planet.